Thank you for registering for the 19th Annual Novo Nordisk New Jersey Marathon & Half Marathon weekend, which includes the 2015 RRCA New Jersey State Championship race in the marathon distance. This is the tenth and final in a series of weekly messages containing important information. Copies of these messages will also be available on our Website and on our Blog. Links to them will be posted on both Facebook and Twitter. Pre-Race: Carpool and plan to be in the parking lots by 6 am. The lots will open at 4:30 am. Expect heavy traffic after 5:30 am, for a 7:30 am start, or take the Special NJ Marathon Race Day Bus option and Click here to register. Please note: Buses from NYC and Newark are SOLD OUT. There are currently seats available on Rahway, Matawan & Middletown buses. Pre-paid parking at Monmouth Park: We strongly suggest the pre-paid option ($5) for these lots. Paying as you leave will cost $10 and will likely slow down your departure. Click here to register, or purchase after picking up your race packet at the Expo. Pre-paid parking near the Finish Area: Guaranteed Parking for spectators at 7-President’s Park is SOLD OUT. Parking near the finish area may be available for $10 at: the Ocean Place Resort, in front of the Ocean Place Resort on Abbotsford Ave. (between the finish area Bus Depot and the Ocean Place Resort, a covered parking garage in Pier Village. Please note: The outdoor parking spaces in Pier Village, while reduced in number on race day, are free over the entire race weekend. Race Packet Pick-up: Free at the Expo. The paid service on Sunday, race day, morning is SOLD OUT. Race Day Security Information for: Athletes, Spectators, Sponsors, Press, Volunteers & Race Staff should be reviewed prior to Race Day. Please share it with your race day support team also. Athlete Guide Information Booklet – We will provide a link to our 2015 Athlete Guide early this week. We hope that it will be a useful recap of information about our entire weekend of activities for you and your supporters. Maps – Here’s a link to maps for each of our races, the Start & Finish Areas and the Expo, all in one place. Most of this information will also be part of our 2015 Athlete Guide (see #1 above). Race Registration – On-line race registration for our Marathon, Half Marathon and Half Marathon Relay races will close on Tuesday evening. Registrations for those races will be available at our Health and Fitness Expo, on both Friday the 24th and Saturday the 25th. Please note: There is NO race day registrations for these three races. Our 5K race will continue to take registrations until its max number has been reached. We are also planning to take registrations during the Expo and also on race day morning (Saturday, April 25th), unless of course it sells out during the Expo.Registration for the Kid’s 1.2 Mile Run on Saturday, April 25th is available both on-line and also on-site starting at 8:30 am, on Saturday morning. On-site registration for this Kid’s run will take place on the Great Lawn, between the Ocean Place Resort & Spa and Rooney’s, in Long Branch. Our Health & Wellness Speaker & Class Series – Plan you visit to our Expo & Race Packet Pick-up service after checking our Presentation and Class Schedule, These presentations and classes are free and a great addition to race weekend. Finding Your Bib Number and Registration Information – Here is a link to find your bib number, for everyone who registered before last week. On Wednesday evening, 4/23, that link will be updated to include everyone who has registered prior to the close of on-line registration. Don’t forget to r write down your bib number and bring it to Packet Pick-up at the Expo, along with your official government issued ID. Runner Tracking on Sunday the 26th – We will again provide a free runner tracking service during our Full and Half Marathons. Here is the link to sign up for runner tracking. There will be timing mats at the follow course locations: 10K. 21.1K, 30K and 40K. Start Line Parking – one more time! – Parking in and around Monmouth Park, the site of our Start Village and Start Line, is plentiful. Pre-paid vehicles will have their own exit line and will simply hand their ticket to the attendant and be on their way. Those who did not pre-pay will also have their own exit line. The cash only fee will be $10 at these exits, instead of the $5 pre-paid fee. Pre-paid parking tickets will be sold during the Expo in the Packet Pick-up area. Start Area Food – This year Hudson Coffee Co. will be available, near the turnstile entrance to the Grandstand Building. In addition to their delicious, freshly ground coffee they will also have: Bananas, Protein Bars and Blueberry Crumb Muffins for sale. Getting Your Finish Time – Finish times will be available soon after you complete your race in a number of ways: 1) download a free QR Code Reader/Scanner to your smartphone and you can simply scan the QR Code on your bib, 2) you can ask a friend with a smartphone and QR Code Reader/Scanner to scan the code on your bib for you, 3) you can go to the “Awards and Results” Tent in the Post Race Festival Area and volunteers will be glad to scan your bib and show you your finish time, 4) you can also get it via a link on the main page of our website. Reconnecting With Your Supporters – In the middle of the Post-race Area is a “Reunion Area”, a place to meet your family and friends after your race. To locate it click on the link to the Finish Area map, watch for signs for it after leaving the Athlete Food Tent and look for the Novo Nordisk Inflatable Arch in the Reunion Area, which will be just south of the main stage. Tell your supporters to meet you there after you finish. Please note: It could take anywhere from 5-25 minutes, or more, to get to the Reunion area after finishing, as you may wish to: stop for pictures, retrieve your gear bag, get your post-race food bag, put on spare clothing, celebrate with friends and fellow athletes, etc. Finish Area Food – Food in the Post-race Festival Area will be available as follows: at the Athlete Food tent, at Rooney’s (entrance on the left just after exiting the Athlete Food tent) and in the Vendor Food Area just south of the Main Stage. Vendor food will be available from the Windmill (hot dogs, hamburgers, chicken, breakfast sandwiches, etc. ), from Hudson Coffee Co. (Coffee, muffins, scones, cookies and iced tea) along with a snow cone vendor. Food and beverages will also be available at the Ocean Place Resort and in Pier Village a short walk south of the post-race area. Getting Back To Monmouth Park – Return busing to Monmouth Park will begin as soon as the return route is clear of athletes. The roadway between the finish area and Monmouth Park will still be closed due to the race until around 10:30am. Please note: The initial wave of athletes and spectators will be gathering in the bus corrals from about 9:45 to 10:00 am. As that wave of riders starts to dissipate, the bulk of the half marathoners will finish. After 10 am boarding will be open for everyone and will continue until 4:30 pm. See below for a list of things to do after your race. Enjoy meeting race staff, past and current champions, dignitaries, etc. in the VIP Areas at Monmouth Park and at Rooney’s Restaurant after the finish line. 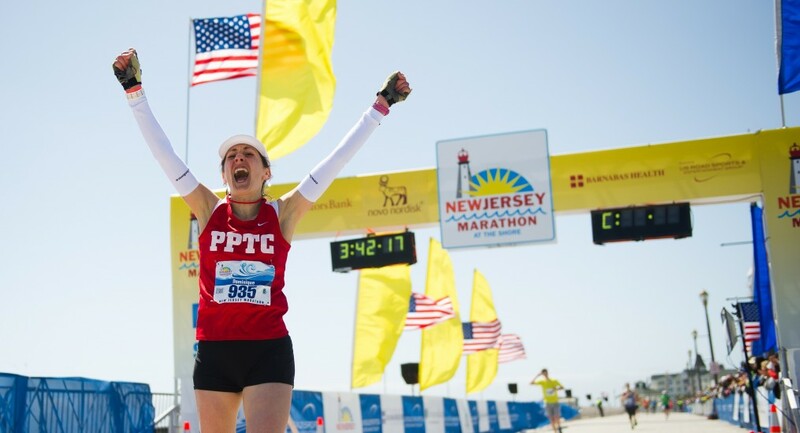 Here are the VIP Program details and on-line registration link..
Get those finish line dance moves ready because we’ll have The Alan Grant Band with special guest Tom Kanach rocking the ‪#‎NJMarathon main stage! Listen for your bib # to be announced as one of our many Finish Line Raffle winners. You’re automatically entered in the raffles as soon as you cross the finish line (winners are randomly chosen by bib numbers) and must be present to win. Enjoy a meal while cheering for family/friends or enjoy a post-race celebration at various locations near the race course. At Rooney’s (discounted drinks – show your bib), at our Vendor Food Area just south of the Main Stage – featuring a NJ favorite, the Windmill, at the Ocean Place Resort & Spa (show your bib for a 20% discount on their fantastic buffet), and also in several places in Pier Village (merchants throughout the Village will be offering discounted food, drinks and merchandise, just show your bib). Have your new spinning finisher’s medal engraved with your name and finish time, just north of the Main Stage in the Post-Race Festival Area. Shop for some great deals on Official New Jersey Marathon and Long Branch Half Marathon gear at our Race store, located just north of the Main Stage in the Post-Race Festival Area. Take a walk on the beach, which is right beside the finish area, and perhaps take a dip in the ocean! On the Courses – Be considerate of each other and the neighborhoods you travel through during you race. These areas are our local streets and neighborhoods. Please deposit all trash in the event-provided receptacles, use only bathroom and porta-john facilities along the course (not the lawns, bushes, woods, etc. ), discard energy gel wrappers, orange peels, banana peels, etc., in trash receptacles, wear your bib while on the course, do not leave the race course before the finish line without notifying a race official and providing your bib number, when walking on the course please stay to the right side and race no more than two abreast so that others behind you will have room to pass. These are a few of the ways you can help make these races safer and more enjoyable for you and your fellow athletes. Respect each other out there. You are all athletes, doing your personal best. Enjoy the journey! Helping Others – Once again this year we are asking you to please bring your faithful training buddies (shoes) with you to the Expo to donate to the MORE Foundation. Thank you! Please remember, it’s “cans in hands” when heading to the Expo again this year. Please join us in helping Move for Hunger to end hunger here in New Jersey!! This will be my last update. I hope that these ten weekly messages have made your planning for race day a bit less complicated and that you know more about all the great things to do at our Expo, what to expect on the course during your race on Saturday and/or Sunday, and at our Post-race Festival on Sunday. Please follow us throughout the year on Facebook, Twitter and on our blog to learn about the new things which we have planned for 2016, and to join us for our free: clinics, training runs, and the races which we sponsor throughout the year! This one’s for you New Jersey and for runners everywhere, as we welcome our friends and neighbors from across the state, the region, the country and from around the world to the Jersey Shore. Later this week we’ll “See You at the Shore”! We hope that you’ll come back again to enjoy everything it has to offer. You inspire us each day with your determination, dedication and good humor (except during your taper weeks of course), as you work through the many issues involved in endurance sports! Congratulations to each of you as you strive to be better than you were yesterday! Best wishes during your race with us and during the rest of 2015. We look forward to welcoming you to our 20th Anniversary race weekend, in late April 2016.